As of the latest data from Mt. Gox, the world's largest and oldest Bitcoin exchange, Bitcoin is now valued at $32.5 per Bitcoin, or nearly 45% higher than its exchange rate last month at $18 per Bitcoin. It has recently traded as high $33.2 which indicates even higher values in the coming days. 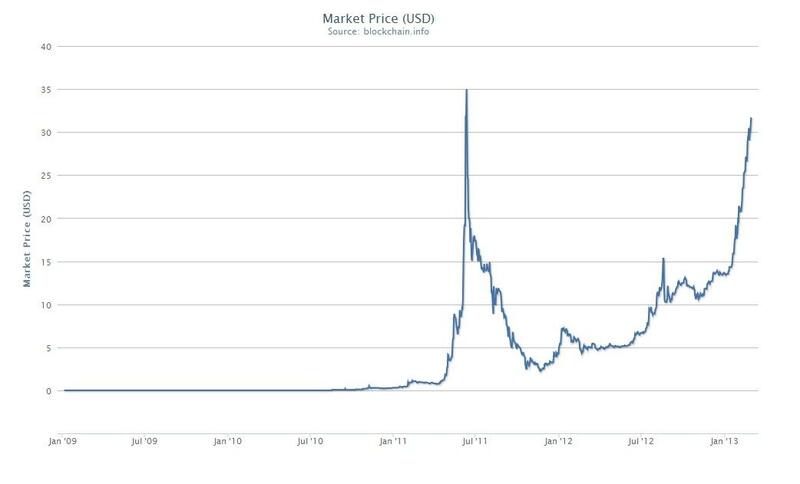 Bitcoin is nearing record highs reached in the summer of 2011, as seen from the graph below from Blockchain, a site which tracks Bitcoin price and transaction data. The steady appreciation of Bitcoin has been attributed to a stream of legitimacy milestones for the emerging virtual currency. In December 2011, Bitcoin-Central partnered with a French bank to become the world's first Bitcoin bank. Euro accounts of the virtual currency are now subject to the same protection as bank holdings, reports The Guardian. More recently, we also reported how Bitcoin users can now buy pizza with the virtual currency such as Domino's Pizza, and possibly more pizza brands soon. This could encourage more retail outlets to consider accepting Bitcoin as a payment currency along with cash, credit card and PayPal balance. "The market still doesn't have a lot of depth, and the exact price is still determined mostly by speculation," theymos told the Daily Dot's Fernando Alfonso III. "I wouldn't be very surprised if the price quickly increased or decreased by $10." theymos notes though that despite the risks of a bubble crash, higher exchange rates can be a good thing overall for the Bitcoin virtual currency. "A higher, increasing price may attract more investment in Bitcoin businesses, which is good for the community. These milestones also generate news articles, which bring in new users. Bitcoin is a lot more than just the price, though; I'm much more interested in the innovative new Bitcoin sites that keep being created."